Okay, we all know that Jeeps are fun. right? But now they’re finally marketing them as such. I mean with FUN as the main focus. In the August 2007 issue of Cooking Light there appears a 2-page Jeep ad featuring a huge picture of the Jeep Rubicon across the center spread. For this basic design to have thrived for so many years is a tribute to its designers. Clearly these guys knew what they were doing in crafting the perfect utility workhorse. What they didn’t realize is that they were also inventing the utility of fun, and that for every Jeep vehicle that proudly served, thousands more would go on to serve in the noble pursuit of — you guessed it — fun. As the years have passed, we’ve learned that different kinds of fun require different kinds of equipment. One person’s fun involves heavy-duty steel rock rails and a winch, while another’s might call for water- and stain-shedding interior fabric. One person’s floorboard drain plugs are another person’s swing-down liftgate speakers. And heaven knows we’ve had fun with various paint packages over the decades. One thing will always remain constant, and that is the core purpose and intent of a Jeep vehicle — to be, from the ground up, a dirt-throwing, creek-splashing, snow-gripping, hill-defying, pothole-shrugging, road-embracing, pink inner-tube toting, story-collecting fun machine. There’s one waiting for you right now, its headlights gazing out on either side of a trademark seven-slot grille, just waiting to play. All it wants if for someone like you to show up, climb in and turn the key. 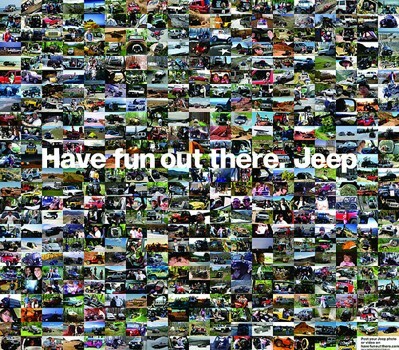 Check out Jeep’s entire marketing strategy for 2007. See why the Jeep Wrangler Unlimited is so much fun. Carve a unique Halloween pumpkin this year… try this fun Jeep pumpkin template! For the girls… some fun Jeep hairstyles. The removable soft top is one of Jeep’s funnest features!